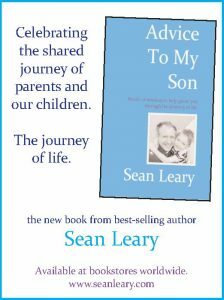 MY NEW BOOK, ADVICE TO MY SON, IS AVAILABLE IN BOOKSTORES WORLDWIDE…. it offers pretty much all the advice I wish my parents had given me, and is good for parents, kids, pretty much all carbon-based oxygen breathing organisms. Previous PostI’m not sayin it was aliens, but it was aliens!Next PostSEAN LEARY: THE (NON) EUROPEAN BOOK TOUR, WITH Q-C DATES!